There was a time, in the late 1800s, when one of the most popular medicines in the country was a product painstakingly brewed by members of the Warm Springs Indian tribe of Central Oregon, using natural ingredients harvested from the beautiful virgin forests and fruitful plains of their home hunting grounds. Or so the manufacturers of "KA-TON-KA, The Great Indian Medicine" would have their customers believe. "The ingredients of Ka-Ton-Ka are all gathered by the Warm Springs Indians in Oregon and Washington Territory," exults Page 5 of "The Warm Springs Indians and their Medicine," a 36-page booklet published by the company in the late 1880s. "They prepare them in their own peculiar manner; and no druggist can duplicate that simple Indian preparation." No specifics are offered about those ingredients, of course; but each bottle of Ka-Ton-Ka gives full details about what kind of benefits one can expect from regularly taking Ka-Ton-Ka: "A cure for all blood diseases, stomach and liver difficulties!" it shouts. "Such as — Dyspepsia; Biliousness; Syphilis; Scrofula; Salt Rheum; Erysipelas; Catarrh; Liver Complaint; Rheumatism; Enlargmement of the Liver; and Diseases of the Kidneys!" And, at the bottom, in bold type: "OREGON INDIAN MEDICINE CO." — followed, in the smallest letters on the entire label, by the line, "Corry, Pa." — the actual city where the stuff was actually made, by the ton, in a factory. 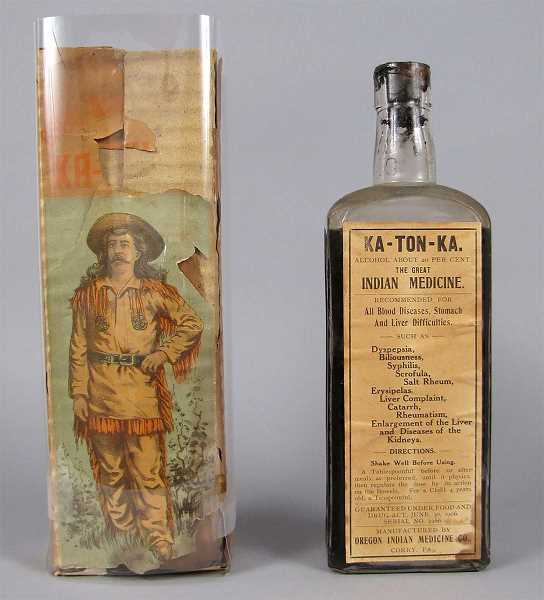 Ka-Ton-Ka Tonic was, of course, a simple patent medicine, one of thousands that the country was awash in throughout the late 1800s. Unlike some others, Ka-Ton-Ka was at least fairly harmless; it was made with sugar, aloes, baking soda and booze (it was 20 percent alcohol). It was one of the most popular patent remedies, sold by traveling troupes of Native American entertainers at elaborate wild-west shows staged at small-town community halls and parks all over the rural parts of the country. The product, and the company, was the fruit of a partnership between a colorful New York native named "Colonel" T.A. Edwards, and a half-Cayuse mountain man named Donald McKay. Donald McKay was the son of Hudson's Bay Co. trapper Thomas McKay and She-Who-Rides-Like-The-Wind Umatilla, a member of the Cayuse tribe. The young McKay worked early in life as a trapper and trader, then as an Indian interpreter for the U.S. Government. 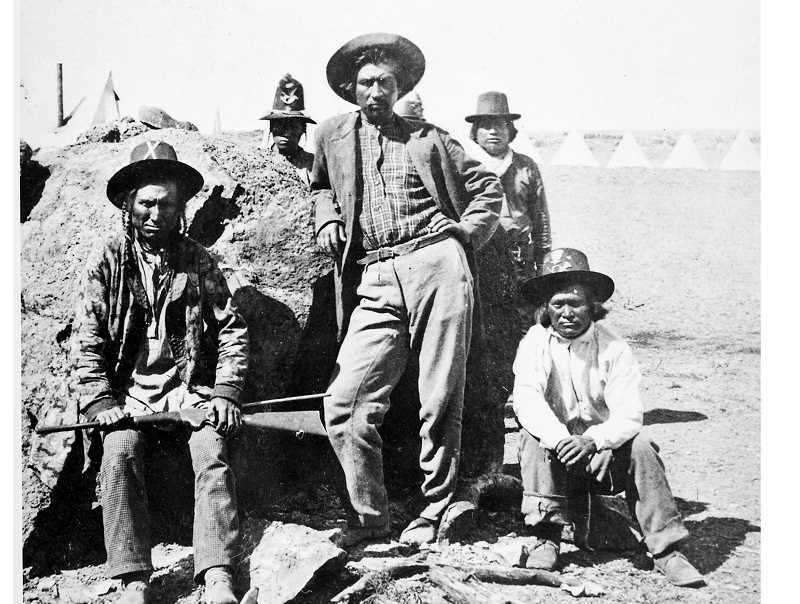 Then in 1872, McKay was put in charge of the Warm Springs Indian Scouts (a detachment of the U.S. Army) and sent to do battle with "Captain Jack," the leader of the Modocs, who were then in the process of humiliating the regular Army by hiding out in the lava beds and defeating every force sent against them. In 1873, the Modocs were defeated with the help of McKay and his Scouts — and news of the action, spun as heroic Wild-West action stories, made McKay nationally famous. And it was about that time that he met Edwards, who was working for the U.S. Secret Service and had been sent out to Oregon to help with the Modoc situation. Edwards was one of those larger-than-life promoter types with which the Wild West seemed to abound. Portraits of him from the time show keen eyes, long hair combed back, a walrus mustache and an "Imperial" goatee — very much like "Buffalo Bill" Cody. And, in every way that counts, he was in the same business as Buffalo Bill. Capitalizing on the half-Native scout's momentary fame, Edwards squired McKay around the U.S. and Europe on an exhibition tour as the "hero of the lava beds." This was at about the same time Buffalo Bill was doing the same thing; Wild West shows of the type that would soon make Buffalo Bill famous were just getting started. But rather than taking his Western Hero and going into direct competition with Buffalo Bill, Edwards chose another path. In the mid-1870s he organized the Oregon Indian Medicine Company, with Donald McKay as a sort of hero-mascot; and got to work peddling Indian folk remedies, the formulas for which McKay supposedly learned at his grandmother's knee. Ka-Ton-Ka was the first one, of course, and it was soon joined by a whole fleet of spurious Warm Springs medical breakthroughs: Nez Perce Catarrh Snuff, Indian Cough Syrup, Modoc Oil, War Paint Ointment, Warm Springs Consumption Cure, Wasco Cough Drops, Quillaia Soap, something called Mox-Ci-Tong, and Donald McKay's Indian Worm Eradicator. This last, by the way, consisted of large pills made of rolled-up waterproof paper. In the stomach, the candy coating would dissolve and the paper would unravel, so that at the sufferer's next "call of nature," there would be visible "evidence" of tapeworm eradication in the toilet bowl. One imagines Donald McKay not being too happy about that particular medicine having his name on it. But none of these nostrums had any real medical value beyond their alcohol content, except as antacids. And perhaps McKay's ego was soothed a bit by the extraordinarily flattering full-color portrait of himself in buckskins printed on the side of each box, with the words "DONALD McKAY, Greatest of Living Scouts" at the top. To sell all this pseudo-Indian hokum, Edwards and McKay started out by hiring troupes to go forth and stage Wild West Indian Medicine shows around the country. And at first, the story of the Indians brewing medicine in the primeval forest proved a powerful lure. But their centrally controlled sales model didn't scale fast enough to slake all the demand quickly enough to establish market dominance. Their main competitor in the Indian medicine racket, the Kickapoo Indian Medicine Co., promptly borrowed the concept and refined it into traveling Indian encampments (complete with painted tipis, a fast-talking bottle-waving "Indian Agent" to do the selling, and a bubbling cauldron of "medicine" that people could actually watch the "Indian medicine men" brewing). They literally hired more than 500 players — real Indians from any and every tribe, and Native-looking white people — to pretend to be Kickapoo Indians for these shows. They were peddling something called "Kickapoo Indian Sagwa," a tonic almost identical to Ka-Ton-Ka. Edwards decided that instead of meeting this challenge head-on, his company would instead corner the market on supplying independent medicine-peddler troupes with product to sell along with copious amounts of promotional posters and fliers, and let them do the work. He'd get a smaller slice, but there would be no central-office bottleneck to slow its growth. Soon all over the rural parts of the country, from the backs of special barouches and wagons and on the stages at community opera houses, in a thousand different ways, traveling medicine shows hawked Oregon Medicine. The idea of these shows was, basically, the same one that was used in the old single-sponsor early radio and TV shows like "Oxydol's Own Ma Perkins" or "The Camel News Caravan." There would be copious entertainment — musical performances, sketch comedy, maybe a ventriloquist — followed by a pitch man urging everyone to get their wallets out. This, of course, was before radio or television, and many little towns that were visited by these traveling shows were so grateful for the entertainment that they would buy whether they felt they needed it or not. And it certainly didn't hurt that Ka-Ton-Ka worked just as well as Tums to settle an acid stomach. It wasn't truly useless — although it certainly wasn't going to help syphilis sufferers, as the label promised, it was fine for "dyspepsia." But it's worth remembering also that in the late 1800s, traveling troupes of Vaudeville players had a terrible reputation, especially in rural communities. So many of them were fronts for gangs of card sharpers and prostitutes that the very name "Theatre" became poisonous; if you've ever wondered why the community theater building in towns like Elgin is called an "Opera House" despite likely never having hosted an opera in its entire existence, that's why. Rural America is peppered with other "opera houses" for the same reason. But if a traveling Vaudeville company wasn't welcome for moral reasons, a traveling troupe of healers selling medicine was fine. For one thing, one knew exactly what they wanted — to sell bottles — and didn't have to worry about immoral hidden agendas; for another thing, if a troupe turned out to be a front for depravity, the company could be appealed to. So these elaborate sales pitches were giving rural Oregon, and rural America, something they didn't trust anyone else to give them. Ironic as it sounds, the patent medicine swindlers were the only ones the public could trust, because they had made peace with that particular swindle. No one was going to go to Hell for having bought a bottle of useless medicine, but plenty of rural Americans would consider themselves or their loved ones in grave danger of damnation if they succumbed to the charms of a Vaudeville tart after a variety-theatre show. But over the first couple decades of the 20th century, that changed. First, stock theatre troops like Baker's Players in Portland started reclaiming the respectability of the stage; and then came motion pictures. By the outbreak of the First World War, not even the most straight-laced community had to resort to getting its entertainment from sales pitches. By then, the Indian medicine shows were already showing their age. McKay died in 1894, although his portrait stayed on the boxes till the end. Colonel Edwards died 10 years later. The company soldiered on, dwindling in size and changing hands several times, until it sort of faded away just before the First World War.